Paulist Fr. Kenneth McGuire was ordained a priest on April 27, 1968. A native of Kentucky who was raised in Ohio, Fr. Ken spent four years in the U.S. Air Force as a young man. He met the Paulist Fathers in 1956 while a student at The Ohio State University in Columbus, OH. Fr. Ken served 18 years at Loyola Marymount University in Los Angeles as director of the Cultural Orientation Program for International Ministers. He also served as director of the University Catholic Center at UCLA; director of the Paulist Institute of Religious Research; director of campus ministry at the University of California at Santa Barbara; and associate pastor of St. Rose of Lima In Layton, UT. From 1994 to 2011, Fr. 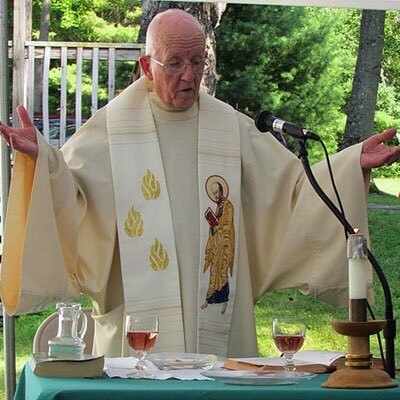 Ken was director of St. Mary's of the Lake, the Paulist Fathers' summer retreat at Lake George, NY. Fr. Ken lives today in Palm Springs, CA. You may also listen to this interview at Storycorps.